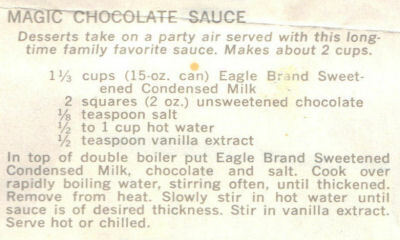 This promo recipe was printed on the back of a label from a can of Eagle Brand Sweetened Condensed Milk and found in a large collection, date unknown. I’ve typed it below along with a scanned copy. Desserts take on a party air served with this long-time family favorite sauce. Makes about 2 cups. In top of double boiler put Eagle Brand Sweetened Condensed Milk, chocolate and salt. Cook over rapidly boiling water, stirring often, until thickened. Remove from heat. Slowly stir in hot water until sauce is of desired thickness. Stir in vanilla extract. Serve hot or chilled.